Crane Lift Box Is convenient and safe lifts supplies, materials, and small equipment to elevated decks, roofs or below ground level. 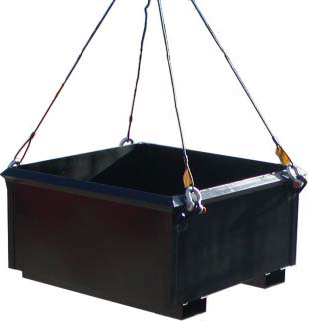 The crane lifting eyes provide a safe 4-point pick up, fork pokcets allow for easy handling with a forklift, engineered to carry up to 4,000 lbs., strong 10 gauge steel shell tub is heavily reinforced with 1/4" angle, rugged heavy duty construction for long term durability on the jobsite and a tub of 4 ft x 4 ft x 2 ft high. Specs: Overall Length 57", Overall Width 51", Overall Height 27-3/8, Capacity Over 1 cubic yard, Maximum Capacity 4,000 lbs, Fork Pocket ID 3-1/8"H x 8-1/4"W, Spaced 31.5" on center.